Vlatko Stefanovski, born in 1957, is Macedonian ethno-rock jazz fusion guitar player, who is well known for his incredible guitar technique. He creates rich soundscapes with imagination, fluency and ease. Stefanovski started playing the guitar at the age of 13. In his late teens he formed the group LEB I SOL (BREAD AND SALT) which became one of the most important names in the music scene of former Yugoslavia. The band played a particular style of fusion music, a blend of Macedonian traditional irregular rhythms and contemporary rock. For the past two decades, Stefanovski has developed a very successful solo career. Already his first solo release ‘Cowboys and Indians’ (1994) showcased his various interests, from deep ethno roots to ambient moods and classic blues. During the last several years he has played and recorded all around the world with many top artists like Jan Akkerman, Bojan Z., Manu Katche, Toni Levin, Miroslav Tadic, Gibonni, Stefan Milenkovic, Kudsi Erguner, Theodosii Spassov and many others. His recent work also includes music for films, theatre and ballet. His latest release ‘Thunder from the Blue Sky’ is a magnificent blues record with guitar legend Jan Akkerman contributing his part and perfectly complementing the almost dizzying playing of the 6-string virtuoso from Macedonia. The extensive joint tour of the two exceptional guitarists through Southeast Europe in summer and autumn 2008 was an absolute triumph. In the spring of 2012 he will be touring Southeast Europe, as well as performing in Sweden, as the guitar super trio “Kings of strings”, together with Tommy Emmanuel and Stochelo Rosenberg. Vlatko has performed as soloist with numerous symphony orchestras, such as: Tonkunstler orchestra from Vienna, Simphonieta orchestra from Sophia, Slovenian philharmonic orchestra – Ljubljana, Student symphony orchestra from Skopje – Macedonia. 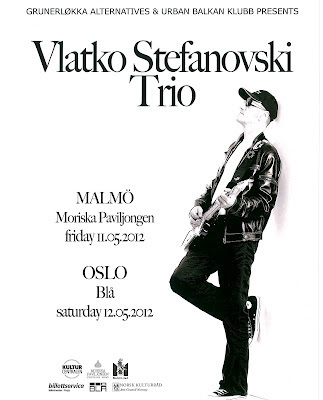 His Vlatko Stefanovski Trio has recently played in Macedonia, USA, Canada, UK, Austria, Germany, France, the Netherlands, Croatia, Greece, Slovenia, Bosnia i Hercegovina, Serbia, Bulgaria etc.